These provide relevant contextual information and actions around a particular item. Callouts are generally used to show the user more information or actions about an item in a lightweight UI. So the callout is the kind of interactive super tooltip – it has a title, a content and even a command menu. 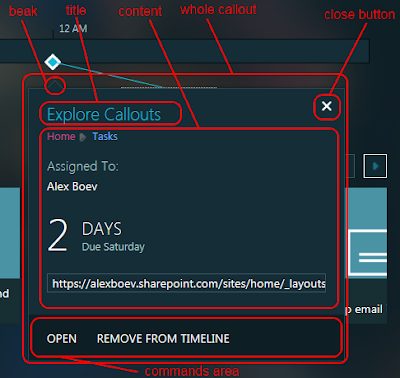 Let’s examine the structure of the callout UI. It’s a little area at the top of the callout. The title isn’t required – there will be no such area if you don’t set its value. It’s the main information area of the callout. . There can be no close button on the callout – if the callout is opened on mouse hover instead of click and if the callout is opened programmatically. There can be a commands area at the bottom of the callout. It contains a menu with one or several actions. 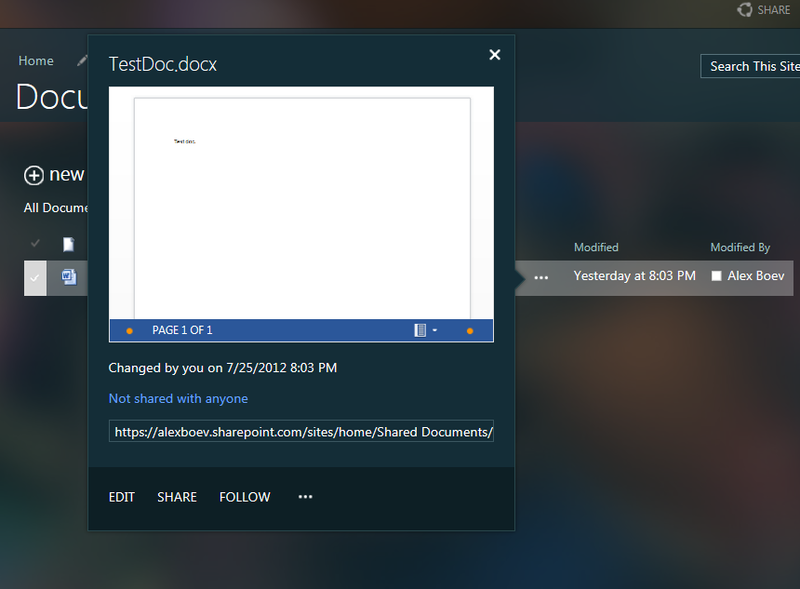 If there are no commands the corresponding area will not be shown. It’s a small arrow-like element visually connecting the callout with its source. It can be placed on top/bottom or the left/right side of the callout according to the chosen callout positioning scheme. In order to use the callout you have to create it. Note thet the creation of the callout is not the same as the opening – callout is created once and then can be opened/closed many times. Choose the HTML element in your UI that will be the source for callout positioning and for events (click or hover) to open the callout. It’s called the “launch point” in the callouts framework terminology. Every callout need the so called “launch point”. It’s an HTML element which will be the source for positioning and opening events for the callout. If you choose the click event to open callout then the click on the launch point element will trigger the opening of the callout. There can be only one callout associated with the specific launch point element at any given time. If you’ll try to create another callout for the same launch point there will be an error. If you need to create new callout for the launch point you have to remove the old ones first. To specify the callout parameters you need to configure an instance of the CalloutOptions class. It’s required by the CalloutManager while creating the callout. When you have the launch point and the callout options prepared you need to call the CalloutManager.createNew method to create and obtain the callout instance. CalloutManager is the kind of singleton used to manage callouts life cycle – to create, obtain, use and destroy callouts instances.